When Fender chose artists to represent its iconic Stratocaster guitar in a new marketing campaign, it didn’t go with the usual Strat-slingers. You won’t see Pete Townshend windmilling or Eric Clapton squeezing out blues solos. Instead you’ll see a pair of young women: Melanie Faye, a 19-year-old Nashville guitarist, and Clementine Creevy, the 21-year-old front woman of L.A. rock trio Cherry Glazerr. “It just had the most perfect, beautiful, punchy tone,” Creevy says of her “sage green” Strat in a Fender promotional video, as she’s shown rocking out with her bandmates. “I want more like, people who don’t necessarily listen to rock to also play guitar,” Faye says in another clip, as she casually reels off soulful licks on her Strat. For Fender—and for other guitar companies, as well—young players like Creevy and Faye represent the future of the instrument. Like many other industries in the #MeToo era, guitar makers are retooling their images. The effort hasn’t necessarily been fueled by accusations of sexual harassment or misogyny, though the business has no shortage of either—just ask any female musician who’s endured the mansplaining of a guitar showroom clerk. Instead manufacturers are taking cues from the fresh economic reality, revealed by Fender market research, that half the purchasers of new guitars are now women. So why all the pessimism about the electric guitar? “To me that narrative—‘Is the electric guitar going away?’—is really, ‘Is my definition of what’s awesome about the electric guitar going away?’” says Anna Bulbrook, founder of the women-led L.A. music festival and community Girlschool. According to Bulbrook, much of the romance surrounding the electric guitar for decades was centered on the image of the “shredder,” a highly technical, flashy player who was nearly always a man. There are a few notable exceptions—Lita Ford, Nancy Wilson—but people are more likely to namedrop Eric Clapton, Jimi Hendrix, Eddie Van Halen, or Jimmy Page. But such a “male definition of what it means to look and act like a guitarist” was always more limiting than the possibilities of the instrument itself—and it ignored much of the guitar’s history in American popular music, where players like country star Maybelle Carter and recent Rock and Roll Hall of Fame inductee Sister Rosetta Tharpe pioneered its use as a lead instrument. Now those same companies often hit up Reyna for advice on how to better reach female players—which sometimes includes suggestions as basic as not treating women like human display stands. Through She Shreds, Reyna successfully lobbied Guitar World magazine to stop featuring women in bikinis on the cover of its annual gear guide issue, and her efforts are partly responsible for the disappearance of so-called “booth babes”—scantily clad female models—from this year’s NAMM Trade Show in Anaheim. 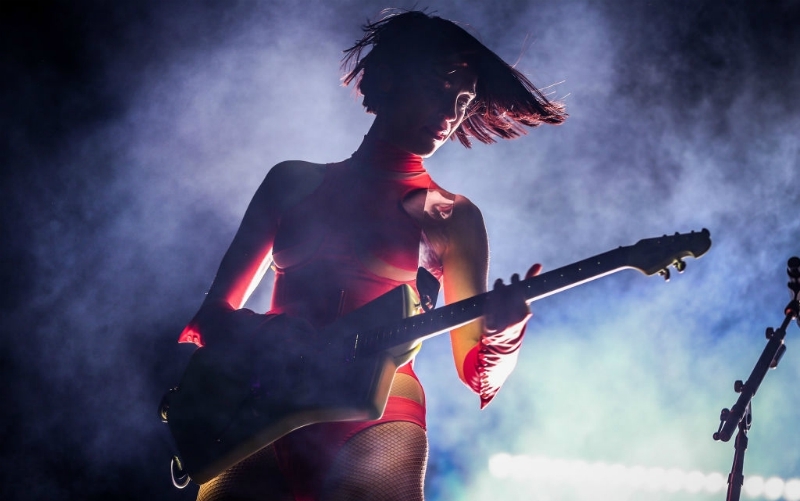 Many in the industry say a real breakthrough moment came when San Luis Obispo guitar company Ernie Ball Music Man asked Annie Clark, a guitarist, singer, and songwriter who makes music as St. Vincent, to design a signature guitar for them in 2016. Though many other female guitarists, from Bonnie Raitt to Joan Jett, have had signature models, they’re usually based on vintage designs or a few minor, cosmetic modifications to an existing model, like a different-colored pick guard. (In fairness to the guitar companies, the same could be said of most male signature models, as well.) But Clark designed hers from scratch, having final say over everything from the guitar’s silhouette to its hardware and technical specs. “I wanted to make something that was retro but future at the same time,” she says of her guitar’s sleek, angular shape. “And really lightweight and ergonomic and just rad.” When Guitar World asked her to pose with it on the cover of their January 2017 issue, she wore one of those novelty T-shirts showing a woman’s bikini-clad torso—a sly dig at the magazine’s old gear issue covers. At the time of the St. Vincent guitar’s release, much was made of the fact that Clark had designed its shape, in part, to be comfortable for female players (“there is room for a breast…or two,” she joked on Instagram). But it’s been a hit with male players, as well. Jack White played one on Saturday Night Live earlier this year, and Omar Rodriguez-Lopez played a custom left-handed version while on tour with his band At the Drive-In in 2016. “We didn’t sit down and say, ‘Hey Annie, let’s design a guitar for a woman,” says Sterling Ball, Ernie Ball’s CEO. “We make tools for artists. We don’t say whether they’re for men or women or whatever.” Ball won’t disclose sales figures, but the $2,199 guitar has been successful enough to spawn a 2018 run with new colors and finishes. “It’s been a success in so many ways,” he says. Clark shares Strauss’ roots in heavy-metal shredding. “As a kid trying to work out Pantera riffs, I was so offended,” Clark once said in an interview, referring to attempts to market “guitars for girls” with pink bodies and sparkly pick guards, But as St. Vincent, she plays in a more unconventional style, which frequently masks the intricacy of her riffs under an array of effects. On her latest album, Masseduction, it’s sometimes difficult to tell the guitars apart from the synthesizers. In this way, she’s come to represent a new kind of guitar hero—one more interested in exploring the possibilities of the guitar as a textural device, rather than in its traditional roles as either rhythm or lead instrument. Not surprisingly, the rise of artists like St. Vincent has coincided with a rise in the sale of effects pedals—by 16 percent between 2007 and 2017, according to She Shreds. Fender’s Jones admits that, when it comes to this kind of representation in how its products are marketed, his company still has a ways to go. A 2018 “lookbook” of Fender signature models, for example—“this isn’t all of them, just a sampling!” a publicist assures me—features 14 artists, all of them men. “The transformation that we’re going through is not complete,” Jones says. But the company’s work with artists like Melanie Faye and Clementine Creevy of Cherry Glazerr—as well as more established guitarists like Australian singer-songwriter Courtney Barnett, whose image graces a wall in Fender’s R&D space in Hollywood, alongside photos of Hendrix and Red Hot Chili Peppers bassist Flea—are steps in the right direction. And Jones adds that they’ve “got a few artists on the radar that we can’t talk about” that will further diversify the brand’s image. So don’t write off the guitar just yet—especially as more and more guitar makers wake up to the changing demographics of who’s playing them, and more and more women continue to break down old “guitar god” stereotypes with the skill and creativity of their playing.